June 17, 2017 (KHARTOUM) – South Sudanese refugees have continued to flee into neighbouring Sudan, seeking safety in the country it seceded from five years ago. 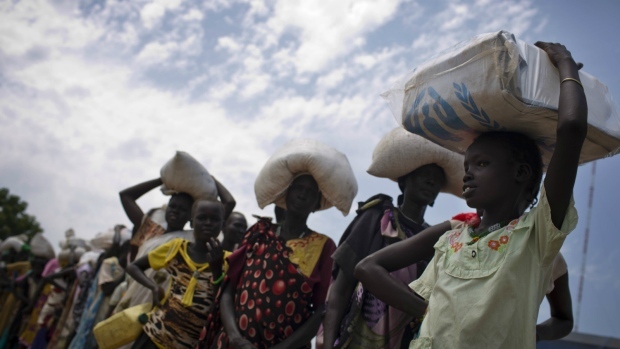 As of 31 May, the refugee population in South Sudan stood at 272,935 individuals, consisting of 65,781 households spread in 21 different locations across South Sudan, the U.N refugee agency (UNHCR), said. In April, South Sudan received 1,493 new arrivals mainly from Sudan’s South Kordofan, and registered 2,397 new born babies mainly from Sudan’s South Kordofan region. 52% of the refugees are female, with women and children representing 82% of the total population. The Sudanese refugee population remains the largest at 251,767 individuals (92%) followed by Democratic Republic of Congo (DRC) 14,541 individuals (5%), Ethiopia 4,739 individuals (2%) and Central African Republic (CAR)1,853 (1%). The majority (90%) of these refugees are hosted in South Sudan’s Upper Nile and Unity regions. More than 375,000 South Sudanese — nearly 90% of them women and children — have fled to Sudan since the outbreak of civil war in 2013. Only Uganda, with 883,000 registered arrivals, hosts more South Sudanese refugees than does Sudan. Some 23,000 South Sudanese, according to UNHCR crossed into Sudan last month, bringing the total so far this year to 108,000. The UN estimates that up to 50,000 additional South Sudanese could flee to Sudan in the next month as fighting and hunger intensify in areas near the border. The U.N lacks the resources needed to respond adequately to this mass exodus. A plea for $167 million to care for South Sudan refugees in Sudan is less than 10% funded. The Khartoum-based Sudan government has been cooperating with efforts to assist refugees from the territory it formerly ruled. Sudanese authorities have also agreed to open three “humanitarian corridors” into South Sudan to enable food and other aid to reach vulnerable civilians more quickly. The number of refugees in the world by the end of 2016 hit record high of 65.5 million, an increase of 300,000 people over the previous year as a result of persecution, conflict, violence, or human rights violations. This figure was disclosed in a report by the United Nation refugee agency (UNHCR) ahead of the World Refugee Day on Tuesday. South-Sudan remained as the country with the fastest-growing refugee population with 64 per cent increase by mid-2016 from 854,100 to over 1.4 million. About half of this population was children. In total, about 3.3 million South Sudanese had fled their homes by the end of 2016 – including 1.9 million IDPs and 1.4 million refugees in neighbouring countries – in what is known as the fastest-growing displacement of people in the world. The figure illustrates the need for countries and communities supporting refugees and other displaced people to be robustly resourced and supported. South Sudan, Syrian Arab Republic and Afghanistan produced 55 per cent of all refugees worldwide. 5.5 million people in South Sudan are expected to be severely food insecure by mid 2017 due to the conflict and the poor economy, the report predicts. The report indicates that developing countries host the majority of the world’s refugees with about 84 per cent of the people in low- or middle-income countries as of end 2016. In Africa, Uganda hosts the highest number of refugees, nearly a million; followed by Ethiopia (791,631); DR Congo (451,956); and Kenya (451,099). On June 22, Uganda will host the solidarity summit on refugees, jointly organized with the UN Refugee Agency, to raise money to manage and find solutions to the crisis. In neighbouring Sudan, there are an estimated 8,500 Chadian refugees while Chad hosts 317,000 Sudanese refugees. The two countries and the UN Refugee Agency (UNHCR) signed two separate tripartite agreements in May on the voluntary return of the refugees to their countries. UNHCR is calling for support of countries hosting refugees as the numbers are likely to rise due to ongoing conflicts. “The figure illustrates the need for countries and communities supporting refugees and other displaced people to be robustly resourced and supported,” the agency said. “This huge imbalance reflects several things including the continuing lack of consensus internationally when it comes to refugee hosting and the proximity of many poor countries to regions of conflict,” it added. The world marks the annual World Refugee Day on June 20, 2017 to reflect on the crisis and to find solutions. UNHCR was still there, helping many of the same people now fleeing an internal conflict, he told local government officials in the northern town of Bentiu. Refugee children from South Sudan walk in Bidibidi resettlement camp in the Northern District of Yumbe on 14 April, 2017. Picture: AFP. The United Nations called on South Sudan’s leaders to take more responsibility for stemming the world’s fastest growing refugee crisis, as it said the number of people displaced worldwide had risen to a record 65.6 million. The head of the UN’s UNHCR refugee agency, Filippo Grandi, said world powers had to step up pressure on South Sudan’s warring parties to go back to talks on ending a civil war that has forced about a third of the population to flee. In South Sudan to launch the UNHCR’s annual refugee report, Grandi said his agency had already worked there for decades, helping hundreds of thousands fleeing the territory’s long wars with Khartoum. South Sudan’s civil war erupted out of political infighting in late 2013, just two years after South Sudan declared independence from Sudan and took over running its own affairs. Since then, nearly 2 million people have fled fighting that the United Nations has said amounts in some areas to ethnic cleansing. There has been a string of failed ceasefires and peace accords. Across the world, the number of displaced people had risen by 300,000 by the end of 2016 from a year earlier – though the pace of the increase had eased from past years, the UNHCR report said. Of the total 65.6 million displaced, just over 40 million had remained in their countries while 22.5 million were registered as refugees abroad. There were another 2.8 million asylum seekers, the report said. Globally, Syrians still represent the largest forcibly displaced population with 12 million refugees or internally displaced – some 65% of the population – by the end of 2016. Turkey hosted the most refugees with 2.9 million people. UNHCR also sounded an alarm over another rapidly escalating crisis in Democratic Republic of Congo, where over 1 million people have been displaced internally and over 30,000 terms have crossed into Angola since August. In South Sudan, Grandi said the combination of violence, ethnic strife, lack of development, climatic factors and international neglect was unmatched anywhere in the world. “There are dead ends all around … I think we can still do something but we desperately need international pressure on the parties to go back to the table and be serious about peace,” he said. Aid workers were struggling to raise funds, partly because of frustrations over the lack of progress in peace talks and partly because the scale of the problem was hidden, he said. “They (South Sudan’s refugees) don’t arrive on the shores of Europe, or Australia or at the border between Mexico and the US Those are the places where refugees become visible and their voices are heard,” he said. While Grandi said ensuring people were safe was important, he warned against setting up “kingdoms of dependency” like the sprawling camps for Somali refugees in Dadaab in northern Kenya that have become permanent settlements. Link to web image here. I am a native of Sudan and now of South Sudan, and I’ve held several positions inside and outside of the government of Sudan. America has always had a special place in my heart. Let me state clearly, that without the help and support of the United States and especially former president, George W. Bush, there would be no independent South Sudan today. South Sudan split from Sudan and became a sovereign nation on July 9, 2011. We are a proud people and have much to contribute to the global community. My president, Salva Kiir Mayardit, fought for many decades in the bush to help bring about our independence. Whatever you think about Salva Kiir Mayardit, he is our president and our people put him in office. The South Sudanese never quite understood why President Barack Obama openly talked about circumventing the will of people, by coming up with a “different plan” for the future of the fledgling nation. In 2015, Voice of America reported that Obama contemplated moving forward “with a different plan,” because he thought that our leaders were “incapable of creating” a lasting peace. Obama and the United Nations tried to enforce a strict August 17 deadline for signing the peace deal that year. The New York Times also reported that Obama said that the world might have to come up with a “different plan” for South Sudan our young country’s feuding leaders failed to meet the August 17 deadline for a peace deal. President Kiir later signed the peace deal, even though he had reservations. “President Obama and regional leaders threatened recently to expand international sanctions and impose an arms embargo if the rival factions did not sign a peace deal,” The New York Times reported. I was thrilled to see the political change in the U.S. with the election of Donald Trump. Republicans have always been good to the continent of Africa and especially to South Sudan. We are hoping to have much better relations with the Trump Administration than we had with the Obama Administration. We have a lot to offer the Trump administration and the American people. We want America to know that we are open for business, investment, and a mutually beneficial relationship. Yes, we have oil, but we also have great agricultural opportunities, as well. We have some of the most fertile land anywhere in the world. Earlier this year, our finance minister pledged to double oil production to nearly 300,000 barrels per day. We also have some of the most fertile, pristine, virgin land in the world. We can also be a staunch ally to the U.S. in the global fight against terrorism. We are neighbors of Kenya and Ethiopia. We are also a majority Christian nation. So, what are our priorities relative to re-engaging with the American people and the Trump Administration? The first priority would be for the U.S. to restore economic assistance to South Sudan, so that we can address the immediate issue of lack of food for our people. With the rainy season having started, food access has become even more difficult. Our people count on the generosity of the American people in this regard. It is my sincere hope that American foreign policy under President Donald Trump will return to the old United States policy of support in friendship, coupled with respect for the sovereignty of states. The government of South Sudan, under President Salva Kiir Mayardit and First Vice President Taban Deng Gai are doing their best to implement the peace agreement that was imposed on them by the outside world under the extreme pressure of President Obama. The president of South Sudan and the first vice president have not yet restored peace to their country, but they are trying very hard. They are enlisting the involvement of their entire population. Our leaders have initiated a national dialogue, involving a diverse group of community activists. Our president and first vice president need sympathy, encouragement and support, to achieve peace for their people. It is my sincere hope, that the Trump Administration will give support for these new peace efforts in South Sudan, rather than holding the threat of regime change over our heads. Bona Malwal is an academic visitor at St. Antony’s College, University of Oxford, United Kingdom. The woman appeared content for the moment, waiting under a tree for a little bit of salvation to fall — quite literally — from the sky. International Development Minister Marie-Claude Bibeau recalled seeing the woman in a northern remote region of South Sudan during a four-day visit that wrapped up Monday. The woman was one of the four million South Sudanese who have been internally displaced because of the four-year-old civil war raging in their country. Another two million have fled the country as refugees. “It’s the middle of nowhere for us, she didn’t even have a roof over her head,” Bibeau recalled in a conference call. South Sudan has emerged as one of the newest drivers of the larger global crisis in displaced people, one that reached epic new proportions Monday when the United Nations released the latest record-breaking number quantifying the problem: 65.6 million people on the planet have fled their homes. The South Sudanese homeless are almost totally dependent on humanitarian assistance because when they do find sanctuary, they can’t resettle safely or grow food to feed themselves, said Melanie Gallant, head of humanitarian campaigning for Oxfam Canada. Uganda, South Sudan’s southern neighbour, has become Africa’s largest host refugee country with 1.2 million refugees, three quarters of them South Sudanese. About 40,000 South Sudanese refugees have entered Uganda every month over the last year, 86 per cent of them women and children, said the World Refugee Council, a new organization run by Canada’s Centre of International Governance Innovation. Michael Messenger, the president of World Vision Canada, has been in the northern Ugandan town of Arua watching the influx of South Sudanese. He said Monday about 100 unaccompanied children are crossing the border each day; their parents have either been killed or have otherwise fallen by the wayside during the exodus. “It’s the fastest growing refugee crisis in the world; children are at the heart of it,” said Messenger. Canada announced an additional contribution of $86 million to assist famine and war ravaged South Sudan. That’s on top of the $36.9 million Canada gave to South Sudan in March. Bibeau said the funds will improve access to basic health services, including family planning and reproductive health care for women and girls, as well as increasing access to food. Bibeau, who also met government officials on the four-day trip, said the suffering can only be alleviated if the warring factions lay down their arms. “We’re obviously concerned about the constant flow of South Sudanese refugees going to neighbouring countries. Uganda has been extremely generous,” she said. The new funds announced Monday are an addition to the Famine Relief Fund recently announced in response to the widespread food crises in South Sudan, Somalia, Nigeria and Yemen, in which the government will match the contributions of Canadians until June 30. “Conflict is really the common theme between those countries,” said Gallant.